One of the main problem we have to face while making a video tutorial is, how are we going to narrate. We can use our voice, or we can open a text editor and type whatever we have to say or we can add subtitles or captions later. 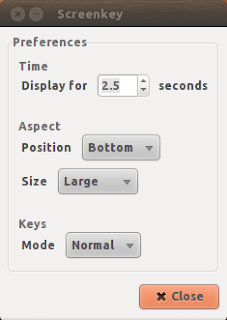 What if Ubuntu captures all the key hits you make on your keyboard and they are displayed on the screen. Screenkey does this and can really help in making video tutorials. Just start your screencast or play any video and whatever you type will show up on your screen. May be there is such feature in accessibility preferences or there are more such applications for Linux, but this is first I have come across. If there are others please let me know. You can change font size, time and position on the screen from the panel applet.